A detachment of four Sukhoi-30 fighter aircraft of the Indian Air Force participated in Exercise Indradhanush-IV alongside Typhoon EFA of the Royal Air Force at RAF Coningsby from 21 -31 Jul 2015, supported by an accompaniment of C -17 Globemaster, C-130J Hercules and IL--78 Refueling aircraft. Enroute inbound the detachment landed at King Fahd airbase in Taif, Saudi Arabia and staged through Athens in Greece outbound. During the Exercise Indradhanush-IV not only did the IAF pitch its SUKHOI -30s against RAF Typhoons, IAF’s Commando Force Garud participated in Para jumping and other security drills with the British. For the British, of course, it was a good opportunity to test the capabilities of their Typhoon against the much admired Sukhoi (both Gen 4 fighters but the Indian Sukhoi is a superior platform what with French , Israeli and Indian avionics technology optimally integrated) and of course "size up" the "cockpit reputation" of Indian fighter pilots! Long distance ferries and participation in inter –Air Force exercises are not new for the Indian Air Force, having done them in the past with the USAF during Red Flag Exercises in Alaska. What is significant in this recent exercise is the staging through Saudi Arabia bit. The Saudis had been known to be pro- Pakistan for long, supposedly funding the madrasah –based jihad factories there for ages and also a rumored strategic tie up with that country for nuclear technology, should Iran have gone nuclear. Recently, however, the House of Saud has found it fit to distance itself from state –sponsored terror from Pakistan, helped India in arresting some key terror suspects and joined US /NATO forces in Anti- ISIL air operations in Yemen. India's recent Bilateral Defence Cooperation Agreement with the Saudi government signed during King Salman’s (then Crown Prince) visit to India in February 2014 is another significant milestone in the Saudis turning pro – West in anti –terror operations. On other hand, U.S. emerging as the top oil producer in the world with its vast shale oil production and consequent lesser dependency on Saudi oil makes the recent nuclear deal with Iran cannot be glossed over as it seals the latter’s nuclear weapons capability at least for a decade if not more. Exercising and flying alongside friendly air forces is the key to aerial cooperation in a theatre or global scenario. The Americans have of late been looking up to India to do their "fire fighting" in the area from the Gulf of Eden to the Straits of Malacca. The Singapore Air Force regularly uses the IAF facilities along our Eastern sea board and it is no accident that all these nations operate American military technology. USA’s “rebalancing” in South East Asia and the proximity based cooperation between Japan, Australia and India as a bulwark against China mark a significant role shift for India as a regional and global player. 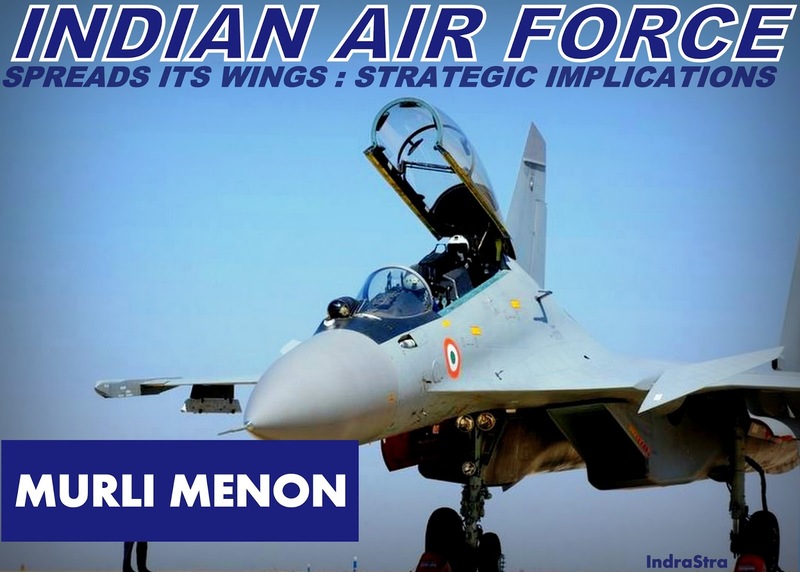 Along with its fast emerging blue water navy wherewithal, IAF’s strategic outreach is crucial in India positioning itself as part of the "Big League". Benefits such as membership of the Security Council would come in due course and India can be justifiably proud that its secular and democratic credentials, along with the new found economic and industrial clout ensures a seat at the high table for itself. Another advantage of a strategic outreach air power-wise is security of India's island territories.There was a time when the IAF was hard put to project its power across distant Indian assets such as the Andaman &Nicobar Islands.Also such long distance air power projection capabilities affords the political masters the options for timely assistance to needy neighbors, be it during natural calamities or even during unforeseen security crises.It should be kept in mind that Sri Lanka sought Indian air power assistance against the LTTE a couple of years ago and at that juncture the Pakistanis were reportedly keen to attempt to reach their F-16s to that country, circumnavigating the subcontinent via China and Myanmar! Of course Pakistani intentions in helping Sri Lanka would clearly be to deny India goodwill there (perhaps with Chinese connivance).In any event too much of water has flown down the Indus since and Pakistan would be struggling to rid itself of terror for the foreseeable future. India , much to the chagrin of its Western neighbor, can now actually be a regional satrap, a humbly capable one at that, through the SAARC forum, and render timely succor to smaller vulnerable neighbors and finally get over its Pakistan – fixation militarily. He was one of the pioneers in the IAF’s Doctrine Think Tank – “Air War Strategy Cell” that produced India’s first Air Power Doctrine, the IAP 2000 in 1995. His interests include strategic studies and since post retirement he contributes to various think-tanks based out of New Delhi, India.